Superior Timber Windows & Doors from Sherwood Timber, Nottingham. Sherwood Timber bespoke timber windows & doors are handcrafted in our joinery Nottingham workshop, using only the finest of timber materials from sustainable sources. Sherwood timber has over 20 years experience in creating the finest timber windows and timber doors and with that in mind, you'll feel at ease. Our dedicated team of joinery experts has years of experience in crafting bespoke solid wood doors, front doors, exterior doors, french bi-fold doors, sash windows, solid oak doors and more. Our high-quality, handmade Timber Doors look the part and will withstand the harshest of conditions. Whether it's a single timber staircases or bespoke Yorkshire timber sliding sash windows, our experienced joinery design team can help you to create something truly unique. Long lasting, highly durable Timber Windows from Sherwood Timber. Whether you're recreating a traditional style timber window or modernising your current windows - we can help. Accoya is timber but not as you know it. Sherwood Timber windows & doors use Accoya Timber. Accoya Timber is a modified wood that uses cutting-edge patented technology allowing it to stay strong and defy the elements for decades. 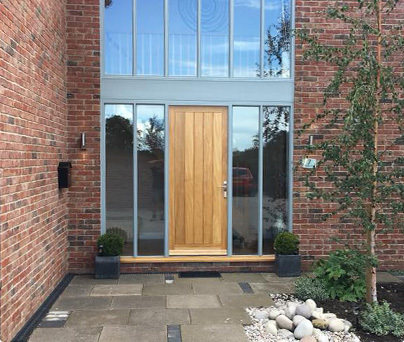 Available in a range of finishes and frames our Accoya Timber range is perfect from any project, from replacing a single front door to a whole timber window and door replacement. Why Choose Sherwood Timber Nottingham? With over 20 years of industry experience, you’ll feel in safe hands when you choose Sherwood Timber Nottingham. All of our timber windows and timber doors are manufactured to order in Nottingham - reducing environmental strain and saving time. All of our products are handmade in our state-of-the-art workshop in Nottingham, UK ensuring a quality finish. Sherwood Timber are friendly, hardworking, reliable, honest and superb at their job. Their dedication and enthusiasm is reflected in their exceptional standard of work. I am thrilled to bits with my bespoke timber windows that were fitted by Sherwood Timber on my cottage. It was great to come across a firm that I could trust! Sherwood Timber is a brilliant Joinery shop. There's nothing they can't do! Their a rare jewel in the building industry.